Morecambe suffered back-to-back defeats in the group stages of this season’s Checkatrade Trophy after losing to Stoke City’s youngsters. Goals from Oliver Shenton and Tyrese Campbell gave the visitors victory with Jason Oswell’s first-half header proving nothing but consolation. Shrimps’ boss Jim Bentley had made eight changes from the weekend loss to Tranmere Rovers with only Luke Conlan, Josef Yarney and Sam Lavelle retaining their places. However, his rejigged squad was forced to play catch-up with only nine minutes gone at the Globe Arena. Moussa Niakate drove inside from the left flank before playing the ball to Shenton, who fired a low shot beyond Mark Halstead. The keeper prevented Stoke from doubling their lead with a fine point-blank save to keep out Mark Waddington’s header. That save was rewarded on 26 minutes when, moments after Kevin Ellison limped off, Oswell headed Morecambe on level terms from Liam Mandeville’s corner. 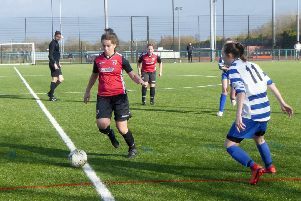 Halstead held a shot from Simrannit Thandi to keep the scores level at half-time, after which Campbell put the visitors in front. He had fired wide on 56 minutes but, seconds later, the striker beat Halstead with an angled finish. Campbell also saw a free-kick pushed away by the Shrimps’ keeper but, despite the late introductions of Rhys Oates and A-Jay Leitch-Smith, the home players could not find an equaliser. Ben Hedley came closest with a low drive from 20 yards in the dying moments but his effort was well held by Stoke keeper Jakob Haugaard. Morecambe: Halstead, Conlan, Yarney, Lavelle, Cranston, Jagne, Hedley, Mendes-Gomes (Oates 81), Piggott (Leitch-Smith 81), Ellison (Mandeville 23), Oswell. Subs not used: Roche, Tutte, Brownsword, Codjovi. Stoke City: Haugaard, Thandi, Souttar (Forrester 31), Wara, Niakate, Shenton, Jarvis, Waddington, Pemberton, Campbell, Tymon. Subs not used: Gyollai, Kyeremateng, Jennings, Stanton.